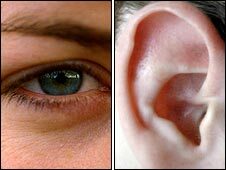 DURHAM, N.C. — Simply moving the eyes triggers the eardrums to move too, says a new study by Duke University neuroscientists. The researchers found that keeping the head still but shifting the eyes to one side or the other sparks vibrations in the eardrums, even in the absence of any sounds. “It’s like the brain is saying, ‘I’m going to move the eyes, I better tell the eardrums, too,'” said Jennifer Groh, a professor of psychology and neuroscience at Duke. The paper appeared Jan. 23 in Proceedings of the National Academy of Sciences. It’s no secret that the eyes and ears work together to make sense of the sights and sounds around us. Most people find it easier to understand somebody if they are looking at them and watching their lips move. And in a famous illusion called the McGurk Effect, videos of lip cues dubbed with mismatched audio cause people to hear the wrong sound. Because the eyes are usually darting about within the head, the visual and auditory worlds are constantly in flux with respect to one another, Groh added. Gruters found that when the eyes moved, both eardrums moved in sync with one another, one side bulging inward at the same time the other side bulged outward. They continued to vibrate back and forth together until shortly after the eyes stopped moving. Eye movements in opposite directions produced opposite patterns of vibrations. Larger eye movements also triggered bigger vibrations than smaller eye movements, the team found.